Perhaps you are vaguely aware of the shield for Leamington which has a chevron on top of a lion with two tails, three stars at the top and a border containing eight fleurs-de-lys. In an idle moment you may have wondered about its origins, what it all represents and if it tells you anything about the history of this village which has become a modern town. In 1855 the Local Board of Health first discussed the possibility of enhancing the prestige of the town by seeking a charter of incorporation for the town. By various stages this ambition came to fruition and the Borough of Royal Leamington Spa came into existence in 1875; it was to survive in that form for just 99 years. It was common knowledge that the new borough needed a common seal or coat of arms and several designs were submitted. A design similar to that referred to in the first paragraph was chosen and this was largely the design of J Tom Burgess FSA who was editor of the local newspaper, The Leamington Spa Courier, which is still published today. It was essential that a key formality, the Grant of Arms by the College of Arms, had to be pursued. Much discussion with the officers of the College resulted in the new Shield, a Crest and a Motto. The shield initially represents the two ancient manors of Leamington Priors to the south and Newbold Comyn to the north by having the inner shield divided across the centre into gold and silver sections. The upper portion represents Newbold Comyn with three red five-pointed stars from the arms of the Willes family. The Clintons who occupied Kenilworth Castle and the Priory held the manor from 1122 and they are represented by the blue border with gold fleurs-de-lys. The green rampant lion facing to the left is from the Arms of the Dudleys, Earls of Warwick, who held both manors from 1563. From 1589 the Earls of Aylesford of Packington became lords of the manors and they are recognised by the chevron which is coloured with a pattern which represents the fur of squirrels sewn together in a cloak. Sadly, the council was not permitted to surmount the shield with a crown to signify the word Royal in its name. The crest which is included above the standard helmet has three components. The ragged staff was intended to refer to the Saxon origins of the village and also to Warwickshire County Council; the rod of Aesculapius entwined with a serpent represents the healthy associations of the spa water and the forget-me-nots derive from Kenilworth Priory and its historic connections with the village. The motto at the foot translates as “Only those things which are Honourable are Great”. The mantling at each side is a standard design. BUT, this all came to an end in 1974 when the Borough of Royal Leamington Spa ceased to exist and local government was totally in the hands of the newly-created Warwick District Council and the county council. It was only after some years of struggle and expense that the Royal Leamington Spa Town Council came into existence in 2002 and it was eventually granted the right to use the same Arms after some controversy about the cost of the grant. 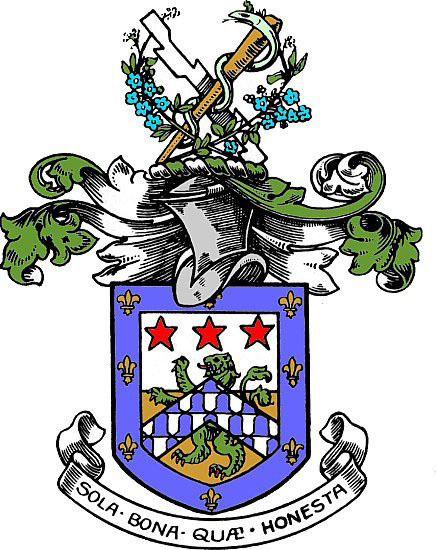 Arms – Per fesse Argent and Or a Lion rampant double queued Vert debruised by a Chevron Vair, in chief three Mullets Gules all within a Bordure Azure charged with eight Fleurs-de-lys of the second. Crest – on a wreath of the colours (argent and vert). 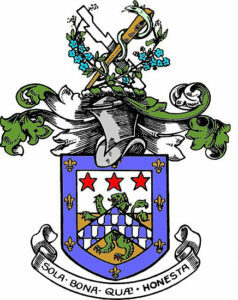 In front of a Staff raguly in bend Argent surmounted by a Staff in bend sinister Or entwined with a Serpent Proper two sprigs of Forget-me-nots in saltire also Proper. Mantling - Vert lined or.